The first-ever Buddha Bar launched in Paris in 1996 and since then has gone on to open in cities like Budapest, Cairo, Dubai, Kiev, London, Marrakesh, Mexico City, Milan, Monte Carlo, Moscow and Prague. More recently seasonal (pop-up) versions of the brand, Buddha Bar Beach, have appeared in Baku, Mykonos and Santorini. 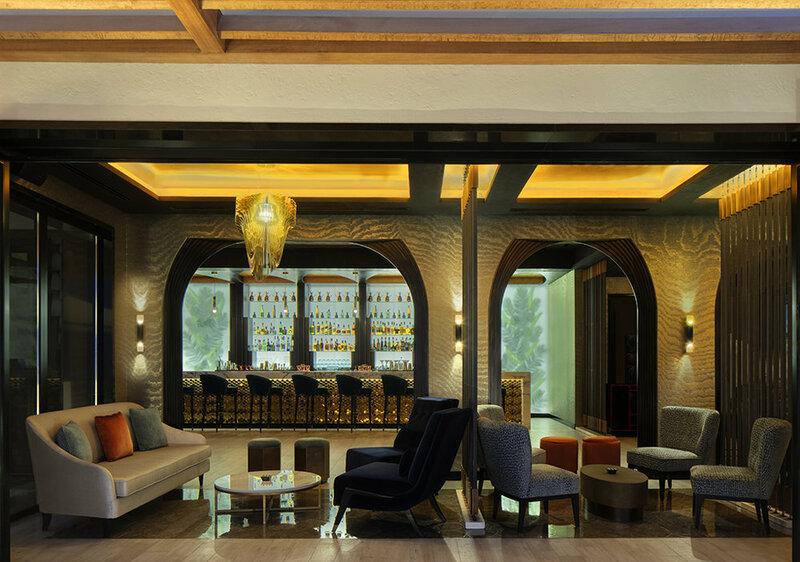 In March 2017 Sedley Place was briefed to design a permanent, all-day iteration of Buddha Bar Beach at the St. Regis Saadiyat Island Resort in Abu Dhabi. Located on a pristine, private beach with panoramic views of the sea and the new Louvre Museum, the venue will offer Buddha Bar’s signature blend of Pan-Asian cuisine, culinary events, drinks prepared by maestro mixologists, music from world-renowned DJs, and nightly entertainments and performers. The new venue is being built in two phases. The first phase consists of two decks. The upper deck comprises the main reception, two restaurants, a separate sushi bar and robata grill, two lounges and a main bar with its own DJ station. The lower beach-level deck features its own DJ station, casual seating, tables, chairs and umbrellas and mood-setting buried lighting. The second phase will consist of a pool and additional outdoor seating and lounging areas. Working with the Buddha Bar team we were responsible for the space planning, ‘look and feel’, design concepts, FF&E and detailed design specifications and drawings for both Phases One and Two. We also provided support to St Regis and the local architect Architectural Consulting Group (ACG) during the construction period. 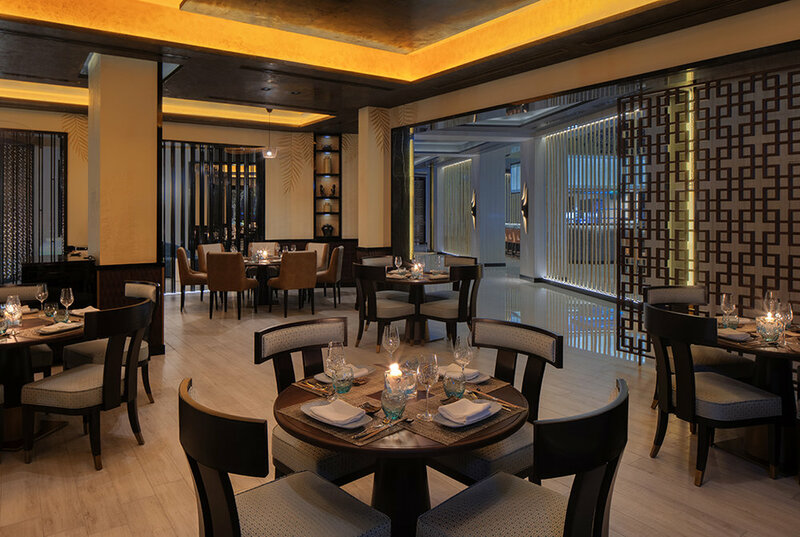 Our design has a bohemian chic style, while being true to the Buddha Bar overall design aesthetic, and features a number of distinctive and bespoke elements. Visitors are greeted by a sculpture created by London-based studio Windsor Works, specially fashioned to represent ripples left in the sand by the tide. 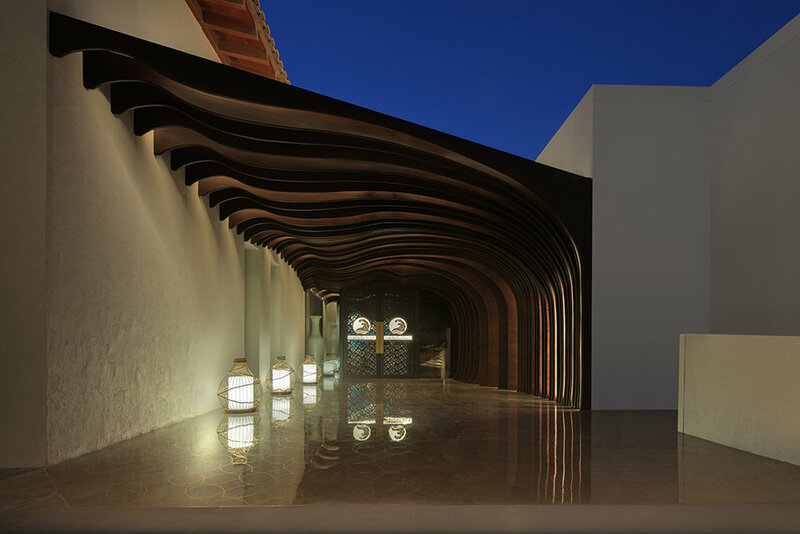 The main entrance has an organic shaped wall and ceiling redolent of waves and sand dunes, and the main reception has a desk carved from one piece of polished and rough Carrera marble, with an illuminated wave artwork as a backdrop. The entrance floor is also made from marble, with a solid brass inlay pattern, polished smooth by the gentle action of sand under foot. 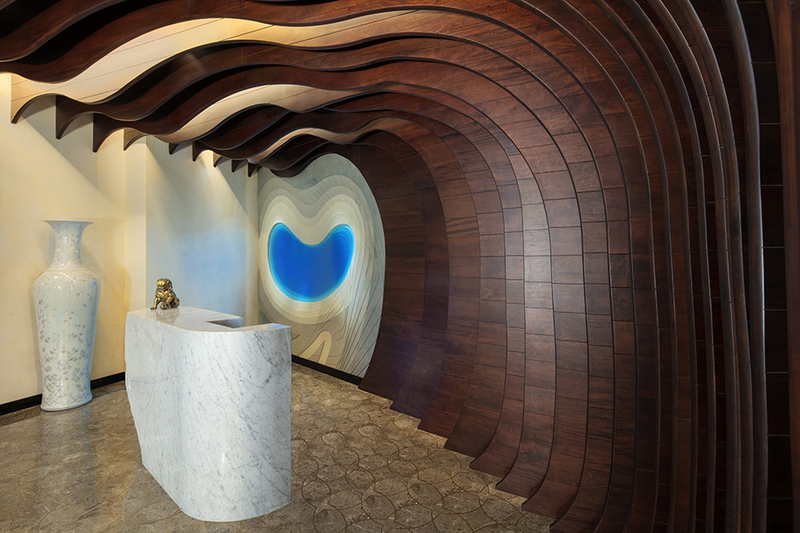 A wave motif, echoing the Buddha Bar Beach branding, has also been reproduced on a grand scale in the main bar. Created out of digitally printed wall tiles, this decorative device accompanies a Japanese landscape which decorates the robata grill and sushi bar, themselves clad in stone. Similar tiles have also been used on the ceiling of the private lounge. We designed lighting, such as lanterns and glass chandeliers, especially for the upper deck, while the main bar features a massive ceiling mounted onyx-effect lighting fixture, with integrated bespoke extractor fans. We also specified all of the furniture; in some cases designing bespoke items such as the lounge armchairs, sideboards, tables, credenzas and chairs. The bespoke furniture gives the place a Mediterranean feel with an Asian soul, through the use of textural fabrics and geometric patterns. Around the perimeter of the restaurant large fold-aside glass doors celebrate the elevated view of the beach. A bespoke timber canopy that curves around the entire façade shelters an upper outdoor deck. For Tarja Visan, co-founder, the new venue is an exciting next step for the brand and a testament to Sedley Place’s understanding of the brand and its service philosophy, ‘for over a decade, we have been working with Mick Nash and his team on Buddha Bar hotels, restaurants and bar designs. From our first project together to this latest one in Abu Dhabi we have found in Sedley Place a great partner to trust with our signature DNA. They understand our needs and expectations, and are able to challenge us with new design directions when we require new perspectives. Throughout each project they have always been pro-active in identifying our priorities and the areas of concern, and they have always helped develop effective alternatives when addressing the issues with our clients like St Regis, the project manager or ourselves. From the initial bid through to design adjustments to the completion of the project, it’s always very easy to work with all members of the Sedley Place team. We truly appreciate their efforts and hard work, their professionalism, their capacity to solve problems, and above all their absolute willingness and dedication to go the extra-mile for us when needed’. Buddha Bar Abu Dhabi officially launches in May 2018, to be followed shortly afterwards by a new Buddha Bar Beach at Mazagan Beach Resort in Morocco (also designed by Sedley Place).